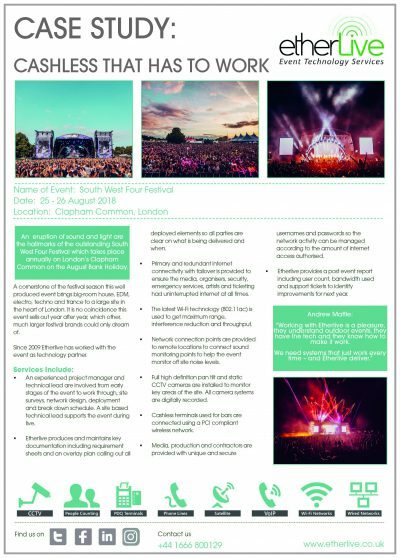 An eruption of sound and light are the hallmarks of the outstanding South West Four Festival which takes place annually on London’s Clapham Common on the August Bank Holiday. A cornerstone of the festival season this well produced event brings big-room house, EDM, electro, techno and trance to a large site in the heart of London. It is no coincidence this event sells out year after year, which other, much larger festival brands could only dream of. Etherlive has worked with the event as technology partner since 2009. An experienced project manager and technical lead are involved from early stages of the event to work through, site surveys, network design, deployment and break down schedule. A site based technical lead supports the event during live. Etherlive produces and maintains key documentation including requirement sheets and an overlay plan calling out all deployed elements so all parties are clear on what is being delivered and when. Primary and redundant internet connectivity with failover is provided to ensure the media, organisers, security, emergency services, artists and ticketing had uninterrupted internet at all times. The latest Wi-Fi technology (802.11ac) is used to get maximum range, interference reduction and throughput. Network connection points are provided to remote locations to connect sound monitoring points to help the event monitor off site noise levels. Full high definition pan tilt and static CCTV cameras are installed to monitor key areas of the site. All camera systems are digitally recorded. Cashless terminals used for bars are connected using a PCI compliant wireless network. Media, production and contractors are provided with unique and secure usernames and passwords so the network activity can be managed according to the amount of internet access authorised. Etherlive provides a post event report including user count, bandwidth used and support tickets to identify improvements for next year. "We wanted to let you know that we've been receiving fantastic reviews and feedback about how amazing, helpful and all round marvelous you and yours were. So we wanted to pass this feedback on to you too. This of course is delightful news and we very much hope to maintain this wonderful working relationship and great atmosphere with everyone on site for years to come."